2) Place 1 sheet of parchment paper on a rimmed plate and pile 1/4 of the zucchini noodles on one half of the paper. Sprinkle with basil. 3) Place 1 fish fillet on top, then layer with 3 slices of tomato and 3 slices of lemon. 4) Sprinkle 1/4 teaspoon garlic on top, drizzle with 2 teaspoons olive oil, and generously sprinkle with salt and pepper. 5) Fold the other half of the paper over the fish, then pinch and roll the sides toward the contents to form a tightly sealed pouch. 6) Repeat with the remaining fish then arrange the 4 pouches on a rimmed baking sheet. 7) Bake for 10 to 12 minutes until the pouches have puffed up and the fish is slightly firm to the touch. 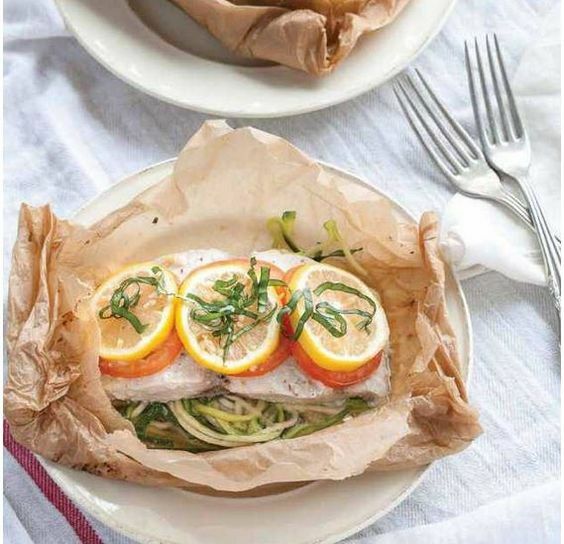 En papillote is a fancy term for steamed cooked food that is served in a paper wrapper. This is a real show stopper when people open the paper after it’s been cooked. I’ve made this recipe before with chicken and it works just as well. It’s great for a small intimate holiday dinner. Take a short cut from Stop and Shop and buy spiralized zucchini. It was about two months ago when I first noticed that Stop and Shop now sells spiralized: zucchini, buttnernut squash, carrots and sweet potatoes. How freaking awesome is that?!?! It’s worth your mental health to pay a little extra and take the help from Stop and Shop. Serve this with a side salad and you are good to go. This is a great recipe to add to your menu if you celebrate the Feast of the Seven Fishes on Christmas Eve. As I’ve mentioned before my Mom’s side of the family is Italian. We do a Feast of Seven Fishes on Christmas Eve. Talk about a lot of food. I tried to explain to my Mom and Aunt Christine that it’s too much food and maybe we do something different this year. If looks could kill, let me tell you! So that idea was thrown out the window; looks like the Feast of the Seven Fishes will live on another year in the Welsh family (my Mom’s maiden name). I hope you have a happy holiday!